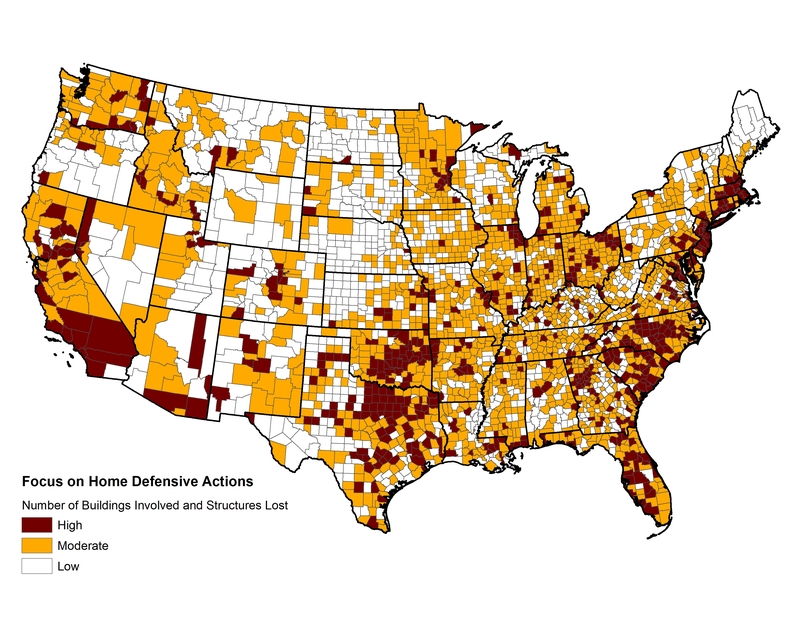 Data explanation: These counties have structures lost and buildings involved (high, moderate, low) [Sum of structures lost and buildings involved/square mile. High = >0.02, Moderate = 0.0021–0.0200, Low = 0–0.00200]. Community clusters 7 and 8 are distinguished by very high numbers of buildings involved and structures lost relative to the area burned. This suggests that they would benefit by focusing on protecting individual homes and actions by individual property owners. Looking more broadly, the density of structures lost or buildings involved in wildfires highlights opportunities across the United States where homes are affected by wildfire and would substantively benefit from greater individual home protection efforts (Option 6.a, figure 3.8). Data sets used in a statistical analysis or classification methodology to produce the variable above.